In the morning on July 25th, in Cần Thơ city, Political Bureau of the city Public Security commences the 1st course to cultivate knowledge on national defense and security for army officers in the city Public Security 2016. 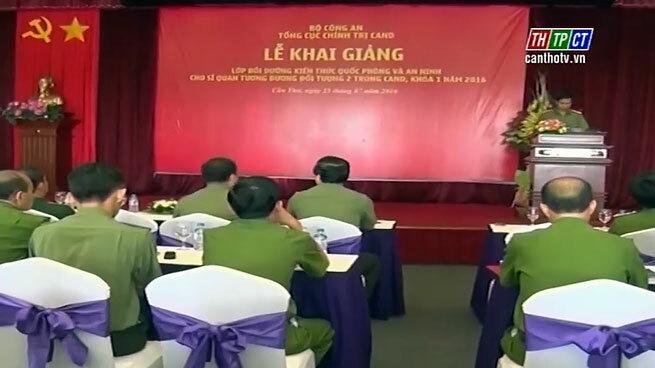 Major-general, Doctor Bùi Minh Giám – Deputy Director of the General Department no.3 under the Ministry of Public Security, leaders of Cần Thơ city Public Security Department and the city Fire Prevention Department come to attend. This is the 1st course of 2016 for 80 army officers, who are leaders of departments, Colonels under Public Securities and Firemen of units and localities. The course takes place from July 25th to 29th, on issues such as policies and viewpoints of the Communist Party, laws of the State on social security and national defense; managing and protecting rights of Vietnam’s sea and islands, so on and so forth, with the aim of preparing real knowledge on national defense and security, creating basic changes on learners’ awareness, help them gain more arguments to well give advices, direct, organize missions effectively./.